This ancient science has done much to satisfy our desires for bodily health and wellbeing in recent times. It has even provided a few small elixirs of spiritual nourishment for many along the way. Actually, that sounds strangely like the concept of dvaitam, or duality that our ancient Rishis warned us of! They taught us that it is this thing called “ego”, the perceiving of ourselves as unique, individual and separate entities, that is the cause of all our troubles. They told us that we are not alone in this world, but “all one” in it, and that freedom from our discontent can only come through the realization of the unity of all of nature and the equality of all mankind. WAIT A MINUTE! The cultivation of the “warrior spirit” is vital in yoga too. In fact, yoga masters have demonstrated that immense effort is needed to overcome the many obstacles on the yogic path, to conquer the ego-self and to pull back the veil of ignorance that overshadows our Divine inner light. Are Yogis Really Communists Then? Communism is a simple three-syllable word that evokes such strong emotion. The root meaning of the word itself simply means to “commune,” to “come together,” to “connect.” Similarly, the word Yoga means “union,” a joining of our lower, worldly self with the higher Divinity; a “communion” of the individual with the Universal. Does that make Yogis Communists? Surely not in the political sense of the word. 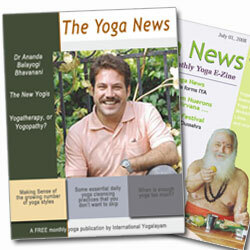 In fact, Yogis are no more Communists than they are Republicans, Democrats, Socialists or Anarchists. The “communion of yoga” subscribes to no dogma or politically motivated ideology; it does not strive to subjugate people or impose beliefs. Yoga enlightens, empowers, and liberates. It seems that great ignorance, misunderstanding, and misuse have befallen this lofty concept of “communing” in our time, both in and out of the political arena. Perhaps in that respect, Yoga and Communism do share some common ground.